Jack Newton and his wife are building a stargazing community 150 miles southeast of Tucson. That Arizona Sky Village was the location from which he made this photo of comet Lulin on Feb. 18, 2009. A recently discovered comet is making its closest approach to Earth in the next few days and offers anyone with binoculars or a small telescope a chance to see some frozen leftovers of our solar system's making. Comet Lulin has, as expected, crossed the threshold to naked-eye visibility for people with dark, rural skies. It hovers just inside that envelope of visibility, however, and is not likely visible from cities, where the glare of urban lights can drown out all but the brightest night-sky objects. "The comet is now naked-eye (if you're out in the country) and is brightening every day as it approaches Earth," said Jack Newton, who has made several photographs of Lulin from his Arizona Sky Village, a residential community committed to pristine natural surroundings and dark skies. "Some feel it will reach maximum brightness on Saturday morning." NASA has imaged the comet, too, finding that it is shedding into space enough water to fill an Olympic-size swimming pool every 15 minutes, as the sun boils the comet's surface material away. Lulin will be closest to Earth -- about 38 million miles, or 160 times farther than the moon -- on Feb. 24 [sky map]. The comet, tinted green because of the chemicals in its head, or coma, has been a delight to seasoned skywatchers like Newton, who know how to find faint objects in the sky and then zoom in on them with binoculars and telescopes. But a comet this dim can prove challenging for the rest of us. "For those not-so-seasoned folks, I would advise them not to expect anything awe-inspiring," said Joe Rao, SPACE.com's Night Sky Columnist. "Visually to the naked eye in a dark sky, Lulin looks like a dim, fuzzy 'star' and in a small telescope it appears like a fuzzball ... somewhat brighter and more concentrated near the center and more diffuse around the edges. As comets go, it's nice, but casual skywatchers are more likely to say, 'That's it?' as opposed to more experienced observers who might actually utter, 'Oh, wow!'" Comets are known for their tails, which, like the fuzzy heads, form when solar radiation breaks up surface ice and minerals. The stuff escapes into space, forming an ephemeral atmosphere that glows with reflected sunlight. Lulin has formed and lost its tail at least twice, when gusts of solar wind tore it off. Observers last night found little or no tail. Still, even a cosmic fuzzball can inspire a wee bit of awe as one goes out, looks up, and spots a frozen ball of rock and ice that's been hurtling through the solar system since its formation 4.6 billion years ago, just now making its first pass through the inner solar system. For most locations in the Northern Hemisphere, Lulin rises soon enough to be spotted in the late evening if you know where to look. The light from objects nearer to the horizon must pass through more of Earth's atmosphere, however, so the best time to see the comet is after midnight, when it's high in the sky. SPACE.com asked Jack Newton if he'd recommend the comet to casual observers Saturday night. "Absolutely," he said. "Binoculars should be just great." On the night of Feb. 23, Lulin will be just 2-degrees south-southwest of the planet Saturn, which Rao said will serve as a good benchmark to locate the comet. Meanwhile, NASA used its Swift Gamma-ray Explorer satellite to photograph Lulin in ultraviolet and X-rays. 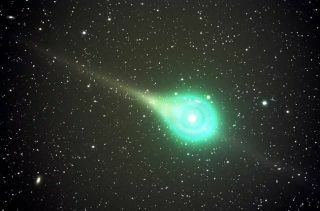 "The comet is quite active," said Dennis Bodewits of NASA's Goddard Space Flight Center in Maryland. "The UVOT data show that Lulin was shedding nearly 800 gallons of water each second." "We are looking forward to future observations of Comet Lulin, when we hope to get better X-ray data to help us determine its makeup," said Jenny Carter, at the University of Leicester, U.K., who is leading the study effort. "They will allow us to build up a more complete 3-D picture of the comet during its flight through the solar system." The comet is headed away from the sun now, back to the dark depths of the outer solar system. It will fade from our view by mid-March.